On 26 May 2018 Hockey for Heroes kicked off their first ever Ladies 'Operation Endure' starting at the National Hockey Centre in Glasgow and finishing on 2 July at Canterbury HC. All proceeds are in aid of the Help for Heroes charity. This #OpEndure see the Army Ladies hockey team travelled across the UK taking part in 8 military challenges and playing 28 hockey games over 8 days. The group came to GHC on Friday 1 July for a fabulous day of hockey and physical fitness. See how it all went here in our report. Thank you to our memebrs who came to AGM 2018 - much appreciated. The Board, Subs Proposal, Budget and changes to the Constitution were voted in. Meeting minutes will be available soon. To see 2018/19 reports go to our Members page (password was in InTouch 18-05-18 - or email ). The Under 12 Boys have qualified for the England Hockey National Finals taking place 12 May in Nottingham! They just missed out on the South Finals Gold medals having been 2-0 up in the Final. Top two teams go to National Finals - good luck to them! Read the South tournament report here. The Under 18 Boys topped their Premier League table, qualifying for League Finals Day. They won this, too, and were also awarded the Fair Play Trophy. Nice guys finish first. Read the Tournament report here. The Boys Under 16s equalled their Indoor National Silver medal with Outdoor National Silver in the England Hockey National Championships held at Nottingham University in April! Read the Finals report here. Our newest team has won promotion with still three games to play in its first season in the leagues. The Ladies 5th XI are on 54 points, 11 ahead of their next closest competitors. Well done to all and especially to Club President and Ladies Captain Maggs Kyte who looks after the 4th and 5th XI doing all sorts of jobs to make thing happen week in and week out including playing and coaching. Under 10 Boys and Girls are Surrey Champions! 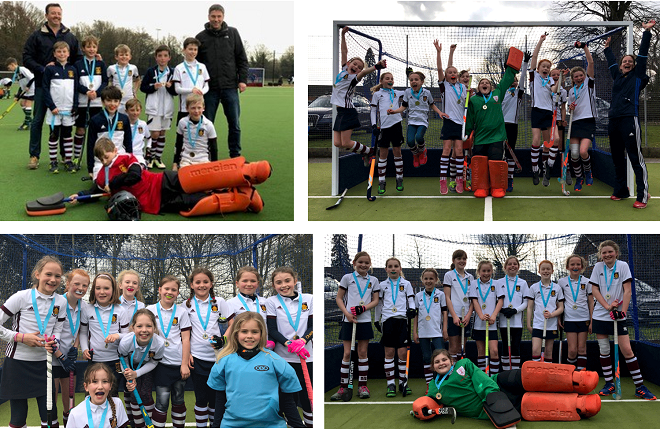 Following the Under 12s medals in the Surrey County tournaments, our Under 10 Girls and Boys both won Gold in their respective Surrey Cup tournaments. Guildford Girls also won the Under 10 Surrey Plate - what a weekend, what a season! Both Cup teams will compete in the England Hockey South Finals on SUnday 6 May. Well done to all involved! The Under 12 Boys and Girls A teams both earned Bronze medals in the Surrey County Cup Finals. This qualifies the Boys for the South Regional Finals coming up in April. Also a massive well done and congratulations to the Under 12 Boys B team who won Silver in the Surrey Plate competition. The boys didn't lose a match all day, scoring 16 goals and letting in 0 - though the penalty shoot-out didn't go their way so it is Silver instead of Gold. GHC Under 18 Boys Won the England Hockey Super 6s, otherwise known as the National Indoor Finals. The Under 16 Boys came second in the U16s Super 6s. And our Under 12 and 10 Boys won the (postoned from before Christmas) Teddington South Invitational. What a great start to 2018!! 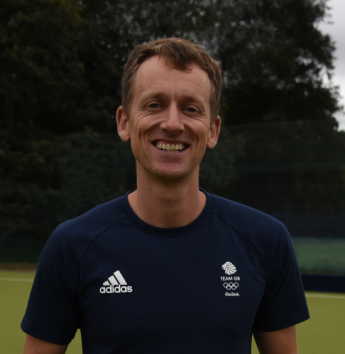 We are thrilled to announce the appointment of two-time Olympian Dan Fox as GHC's Director of Junior Coaching. Our Junior Section has been improving year on year both in numbers of young players we attract and also in the quality of what they achieve as individuals and teams. The past five years have seen GHC Junior teams in ten National Finals including three National Champions and many awards at Regional, County and even International level. And we have more players than ever before succeeding in the England Hockey Player Pathway, including a handful who competed in the recent National Selection tournament. This progress has been thanks to our huge and dedicated band of volunteer parents and siblings, without whom GHC wouldn't exist. 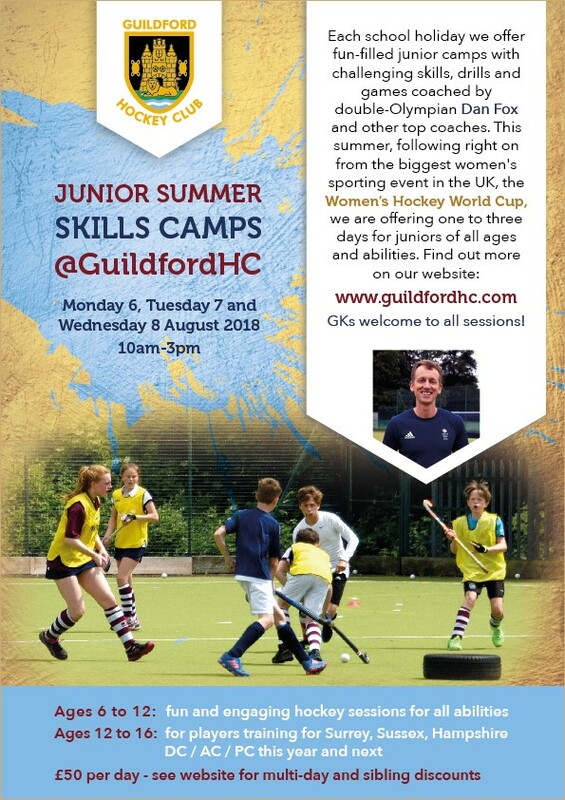 We recognised two seasons ago, however, that introducing professional coaching would benefit our players and volunteer coaches alike and that as the game of hockey progresses, so do we need to keep improving to deliver the best hockey experience we can for our junior players. The Director of Coaching role is one that will build upon our successes by improving the quality and learning of our large coaching pool. Read about the role from Dan's letter to the coaches here. Dan is a two-time Olympian (2012, 2016) with 164 England and Great Britain caps. He was named UK Sports Writer of the Year 2016 and England Hockey Performance Player 2017. He played his most recent club hockey with Holcombe HC including in the Euro Hockey League. Dan is Director of Hockey at Charterhouse and coaches with England Hockey (U21s, U18s, Performance Centres and more). We are really looking forward to the season! 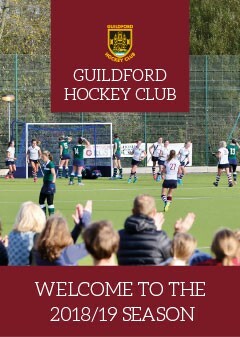 The GHC Season Brochure is here - members please collect your copy from your Captain or in the clubhouse.